Stonewall Gazette: Gotham Knights win Bingham Cup! Gotham Knights win Bingham Cup! "There is a new champion in international gay rugby, the Gotham Knights. The New York City squad beat two-time defending champion Sydney Convicts, 18-15, to win the fifth Bingham Cup, held in Minneapolis. The Convicts had won the event in 2006 and 2008, after San Francisco Fog won the first two cups," reports Outsports.com. Check out the photo gallery here! The Mark Kendall Bingham Memorial Tournament or the Bingham Cup is a biannual international, non-professional, gay rugby union tournament, first held in 2002. The most recent tournament was held in Minneapolis, Minnesota in 2010. The tournament was named after Mark Bingham, a former University of California, Berkeley rugby star who had played in the May 2001 tournament for San Francisco Fog RFC and cofounded the Gotham Knights RFC. 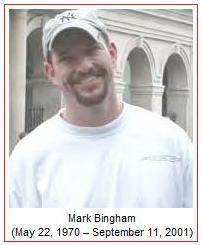 Mark Bingham died in the September 11, 2001 attacks on board United Airlines Flight 93. He is generally accepted to be one of a group of passengers who fought with the hijackers aboard the flight, which eventually led to the hijackers crashing the plane into a vacant field in Pennsylvania instead of targets in Washington, D.C.. At the time of his death, there were approx 8 gay-inclusive rugby clubs worldwide, and he was helping to create others. For more info please visit: Mark Bingham.